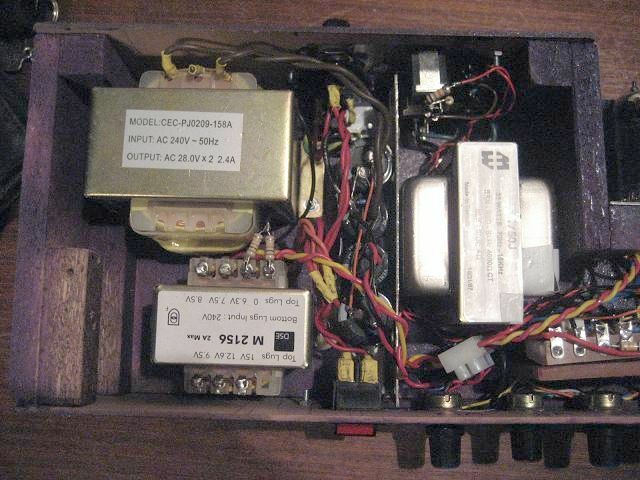 A clone of the classic Vox AC-30 amp. New: 8/11/10 - Jump down to the gallery of his latest, more conventional, built. Evgeny wrote to me back in August '08 of his desire to build something like the AVA100 idea, but a bit more full-blooded. 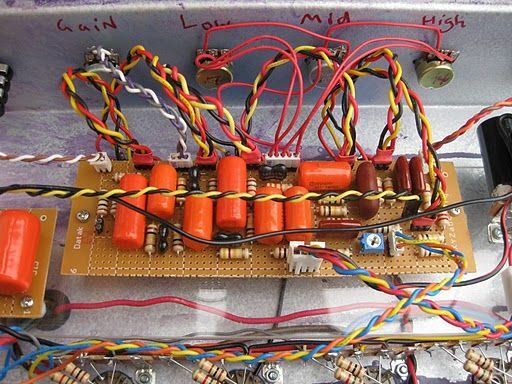 Over time these ideas condensed into clone of the classic and venerable Vox AC-30 using the AVA multiplier HT and 100V line trannies for output. And like all such ideas, what actually got build was a bit different again. 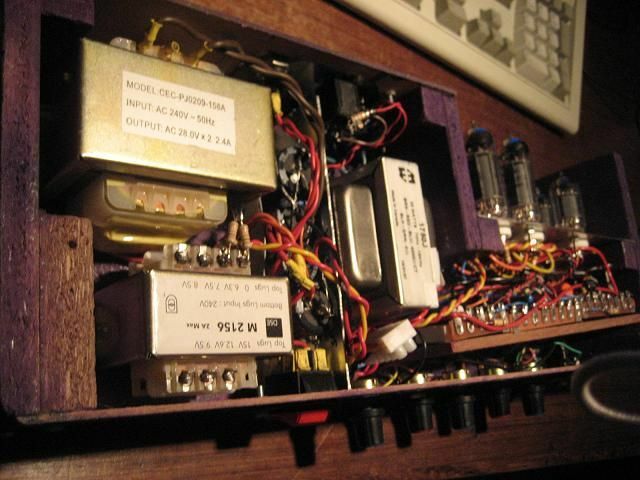 Reverb( i have an 8ohm accutronics). 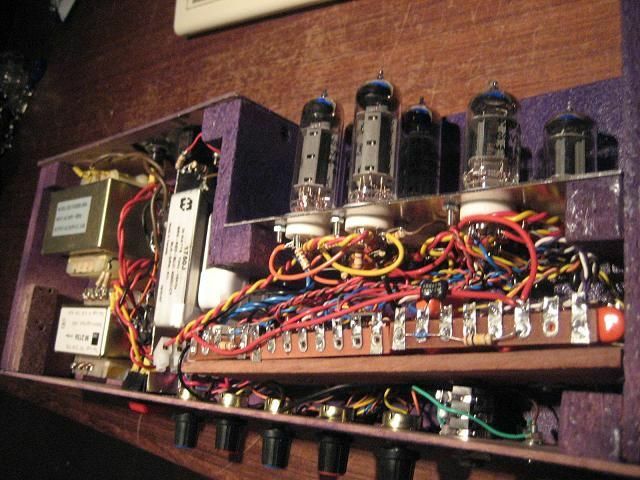 Is this a bad impedence for tubes? i've built a SolidState driver for it but will this take the whole point out of the tubes if i add it just after the FX loop? 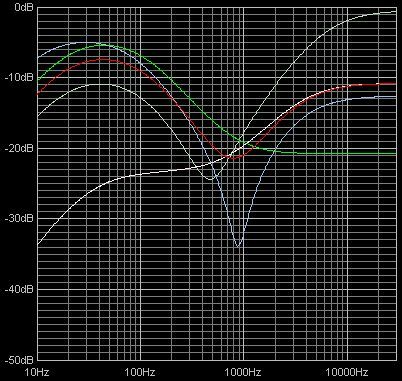 As for the output state, maybe 4 EL84 or 2 EL34, i'm hoping for 30-40watts-ish. Since then i've been looking at schematics and constantly changing my mind on builds, but hopefully i've decided on what i want and i have a few questions. Reverb -> Rod elliots SS tank driver. i'm very much a blackmore, steve morse, maiden, halen player and don't fancy the bottom end style (korn, grunge) very much, leave it to the bassist i say. My current setup is } diy frankenstrat } tonepad's screamer } elliots guitar preamp } elliots standalone spring } eliots guitar power amp } 2 x 12" 70W Jenson Mod's in an openback. 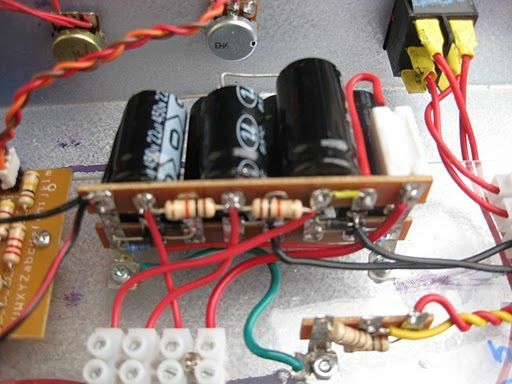 With the reverb i was just going to use it like i am now, basically a stand alone unit where after the preamp i just put it into rod circuit then the OUT of that becomes by Line out/send. I cheated a bit by using a hammond OT and Orange Drop Caps, i was in the US for a few months and figured I'd pick some up. 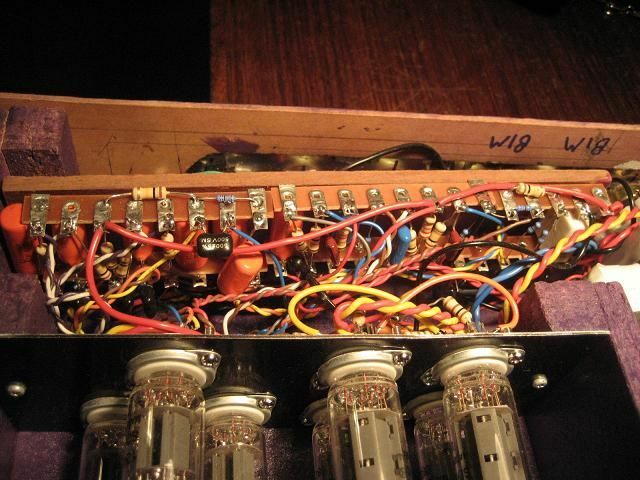 :P.
Evgeny's full circuit (just click to open in new window, or right-click and “Save Target As...”). The mere mention of “orange drop” caps got me thinking. Back in Ye Olde days of Yore waxed paper caps came with a black band around one end. Even brand new these caps were a horror, and time has only compounded matters - kill on sight! But ... the one nice thing about them was that the end that connected to the outermost plate was marked with a black ring. Most caps are still made basically by creating a long thin cap sandwich, then rolling it up and dipping it in some goo. The result is that generally one plate of the cap is more on the outside than the other. In the case of a bypass cap it is better to have the outer connected to ground so the inner is screened from both pickup and radiation. In the case of an interstage signal coupling cap it is better that the outer be connected to the lowest impedance node, in our case normally the anode of the driving stage. 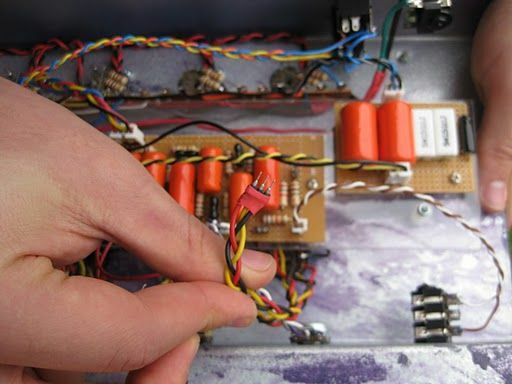 If the cap isn't specifically marked you can conduct a simple test by holding the cap body (to inject some hum) and try connecting each end in turn to the open input of an amp. You may find that one way around there is less pickup and noise, and this identifies the “hot” end to go to the grid in question. 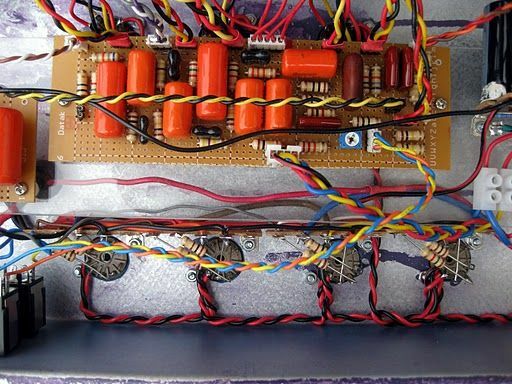 If you are new to amp building, or even building electronics in general, a close study of the detail of these photos would be well worthwhile. 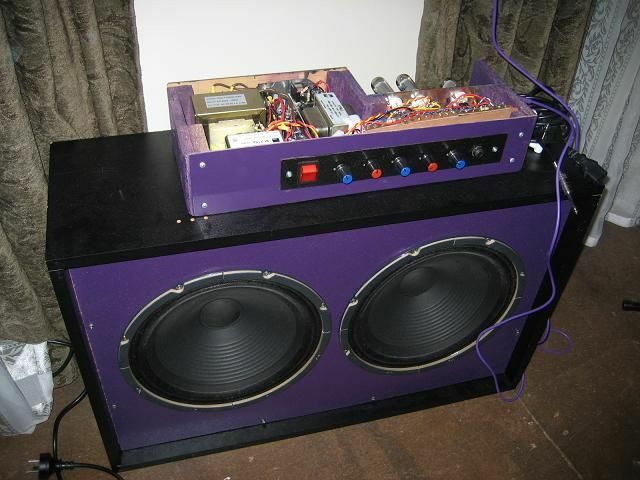 With this amp Evgeny has produced a build that contains much that is worth imitating. He has made creative use of what is to hand, tag strips and Vero (strip) board, inter-board connectors recovered from old computer hardware, and lots of heat-shrink sleeving. 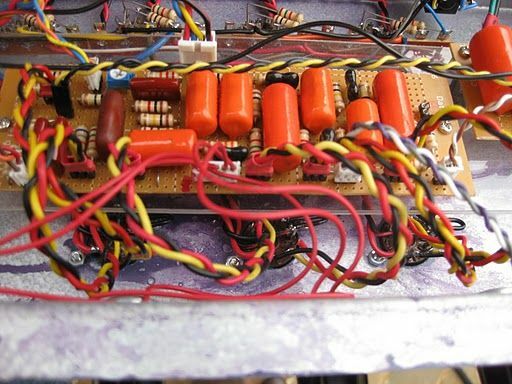 An interesting feature which is not at first obvious is that a lot of the circuitry has been assembled on a clear plastic sub-chassis.